Those born between February 7, 1997 and January 27, 1998 are members of the Fire Ox Chinese Zodiac sign. The OX is quiet, steadfast, methodical and can tolerate difficulties. Ox people are hard working and down to earth. They are exceptionally clever and creative with their hands. In business, the ox often brings prosperity, not through entrepreneurial imagination and risk, but as a result of logical thought, resolute practicality, and honest endurance. Ox people should seek their fortune as a surgeon, dentist, architect, tailor, or technician. The influence of the Fire Element gives the Fire Ox a dynamic and impulsive nature not commonly seen in other members of the Ox sign. The Fire Ox envisions great things for their life and subsequently, is highly motivated to achieve these goals. With added intensity, Fire Oxen often make the most effective leader, as others are quick to rally behind their passion. Although driven, a compassionate disposition often lies behind the authoritative and determined nature of the Fire Ox. The high aspirations of the Fire Ox create a variety of career options to choose from. Although the Ox is usually drawn to more organized and structured careers, the drive of the Fire Ox could lead to success in fields such as sales, business or real estate. Similarly, the material concerns of the Fire Ox could lead to pursuits in the entertainment industry. Rising actresses Bella Thorne and Isabelle Fuhrman are both Fire Oxen born in 1997. Although the influence of Fire is a great strength of the Fire Ox, it can become a challenge if left uncontrolled. The Fire Ox has a tendency to rush into action without considering all sides or thinking things through. Similarly, the Fire Ox can be blinded by their combative tempers. 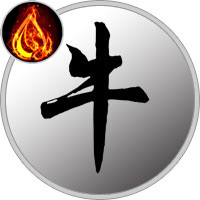 Those born under the Fire Ox sign are encouraged to moderate their passion, being sure to embrace a more realistic view of themselves and their limitations. Fire Oxen are natural born leaders. In fact, they’ll often hold positions of importance at work and in the community. They have short fuses and tend to react impulsively instead of considering the opinion of others.